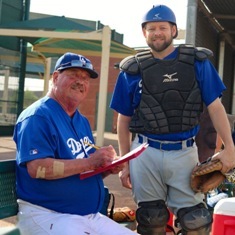 Marty will be seen once again this year in Arizona with his 2015 World Series Father/Son champion Salt Lake City Dodgers. For his dedication to the Father/Son division and his annual successes, MSBL Founder and President Steve Sigler has inducted Marty into the 2017 class of the MSBL World Series Hall of Fame. There must be a memory or two from a dozen years of Father/Son competition in the World Series. “In 2006 we were playing at Tempe Diablo Stadium and playing against a real fire baller and everybody was striking out. You get those young guys in the Father/Son division once in a while. I came up and he threw a fastball inside and it was a called strike and then he did the same thing outside and the ump also called it a strike. Then he tried to throw a curve and I nailed it up the middle and undressed him for the go ahead run. We didn’t win but it sure felt good to drill him. Once again you’ll see Marty and the Dodgers down in Arizona and it is a pretty sure bet that they will be there with more than ten guys. Kathy will see to that!